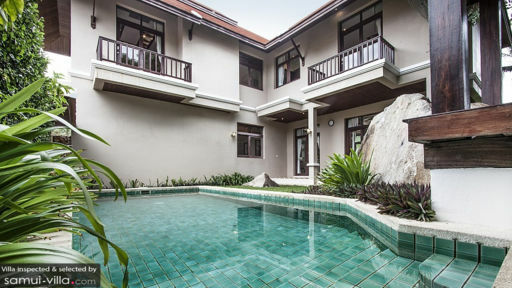 Nestled in a prime hillside location in Chaweng Noi, Sunrise Villa 1 looks out to a sweeping landscape made up of emerald foliage, rugged coastlines and the ocean. 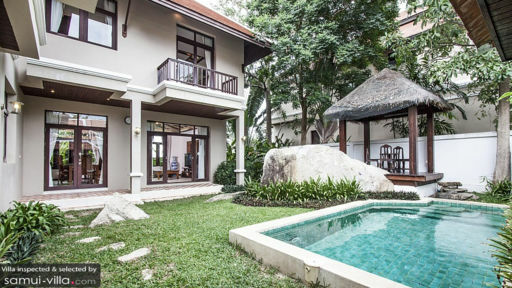 With three bedrooms, a private pool and a full range of modern amenities, Sunrise Villa 1 is ideal for housing travelling parties of six. Six guests are accommodated in three bedrooms. Each of the rooms are furnished with double beds, accent chairs, writing desks, flat screen TVs and wardrobes. A treadmill occupies one of the bedrooms - perfect for villa vacationers seeking a holiday workout! The attached en suite comes equipped with a vanity, shower recess, bathtub and toilet. High walls strewn with tropical foliage surrounds the garden at Sunrise Villa 1 to create ultimate privacy. The sparkling pool is perfect for cooling down on hot, sunny afternoons, and the thatched roof sala by the poolside offers a cosy spot for shaded siestas. Ideal for private relaxation and social gatherings, the common area at Sunrise Villa 1 features a lounge, dining area and kitchen set out in an open layout. The lounge is cosy and comfortable with sofas, a coffee table and flatscreen TV. Sheer curtains help block out the glare of the sunlight, while ceiling fans and air conditioners keep the interior cool and breezy. The lounge extends out to include a dining area and open kitchen with an all-white decor. Outfitted with appliances like a stove, steamer, blender, toaster, microwave oven, fridge and electric kettle, the kitchen is well-equipped to meet your culinary needs. Sunrise Villa 1 offers twice weekly housekeeping services. Your villa manager will readily assist with airport transfers and transport arrangements. Private dining services available on request. 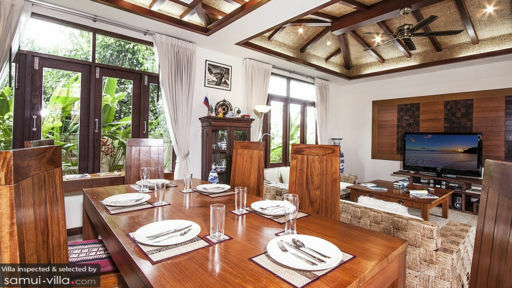 An array of local amenities, restaurants and shops are within easy reach from Sunrise Villa 1. Dine out at Marco Polo Resort and Restaurant, Phensiri Thai Bistro or Sheraton Samui Resort (located within five minutes’ drive from your villa). Popular Chaweng Beach is 14 minutes’ drive away, while the quieter Chaweng Noi Beach is five minutes’ drive from your villa. The beachfront is narrower at Chaweng Noi, but there’s lesser tourist crowds and beach vendors to contend with. If you’re looking for action and a vibrant nightlife, Chaweng Beach, with its variety of bars and trendy clubs is a great bet. Away from the beach lies Chaweng walking street. Wander through its myriad stalls to discover the local street food and shopping scene. There’s also Pai Cookery Class (four minutes’ drive) for Thai cooking classes and Superpro Samui (three minutes’ drive) for Muay Thai classes and CrossFit workouts. Families will enjoy day trips out to nearby attractions like Big Buddha (24 minutes’ drive), Lad Koh Viewpoint (six minutes’ drive), Fisherman’s Village (15 minutes’ drive), Wat Lamai Folklore Museum (15 minutes’ drive) and Canopy Adventures Secret Falls (32 minutes’ drive).